Between October 8 to 11 in Promenada Mall Braila parking, Romania has held the eighteenth edition of the Fair of Agriculture now called AgriCulture. 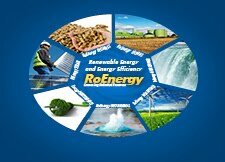 Are present in addition to companies in the agriculture industry also companies involved in green energy sources. Trust Euro Therm exhibited a machine where products could be seen. Near you can find Ecohornet company that shows equipment thermal how make energy on pellets based on their patent. Ecohornet developed his own production base in Romania. Another of interest is Cyclon Tech SRL how shows alternative energy. You can see Apricus Solar AP20 thermal panels and also a photo-voltaic panel . Cyclon Tech SRL is Apricus distributor in Romania. The fair is organized by the Chamber of Commerce Industry and Agriculture Braila and is already a traditional event in the area of Romania.